Alsace is the fifth-smallest of the 27 regions of France in land area (8,280 km²), and the smallest in metropolitan France. It is also the seventh-most densely populated region in France and third most densely populated region in metropolitan France, with ca. 220 inhabitants per km². Alsace is located on France’s eastern border and on the west bank of the upper Rhine adjacent to Germany and Switzerland. Historical decisions, wars, and strategic politics have resulted in Alsace being administered as a “region” within the Republic of France. 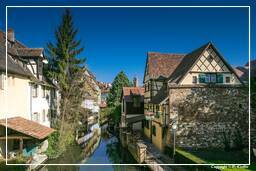 The political, economic and cultural capital as well as largest city of Alsace is Strasbourg. Because that city is the seat of dozens of international organizations and bodies, Alsace is politically one of the most important regions in the European Union.